I guess .jpeg would be next, but this image format is a bit more complicated. JPEG is less complicated than PNG, I think, just requires a bit of math. I have a little JPEG decoder in ToaruOS. I thought PNG was fairly easy once I got the documentation figured out. I will have another look at JPEG and visit your decoder to see how you do it. The other example is all the disk images (~ 12 MiB) I have and the numbers are "185 KiB (my)" and "111 KiB (Linux)". Here the difference is definitely bigger. I'd say there's at least an 80% chance my OS GUIs will end up with a lot of black surfaces and glowing neon lines. Another windowing system implemented in-kernel... tsk tsk! But seriously, congrats on the Doom port! This video is a year old, got anything new? Yes, I tried recording something knew but VirtualBox refused to let me. I'll try again later. My suggestion is to use OBS to screen-cap VirtualBox or QEMU - that's how I do all my videos these days. I found VirtualBox's integrated video recording to have weird stutter issues. I'm working on my GUI. "I ain't afraid of no quake". Wait, you got Quake to run?! If the Github page is accurate, you started in September last year. I'd say that this is really impressive, if that's the case. I've ported SDL 1.2 (video, events, threads and partially timers and audio). Since quite a lot of games use SDL, porting them requires just some minor tweaks. :D I've ported SDL 1.2 (video, events, threads and partially timers and audio). Since quite a lot of games use SDL, porting them requires just some minor tweaks. Your next step should be to port Bochs, so you can run your OS in your OS. Haha… What have you done?! OSception? Good job! That would be funny if I could do that as well. But not happening right now. I still have some issues with writing on ext2 (which is the only writeable filesystem on my OS for now). And I thought about actually trying DOSBox. 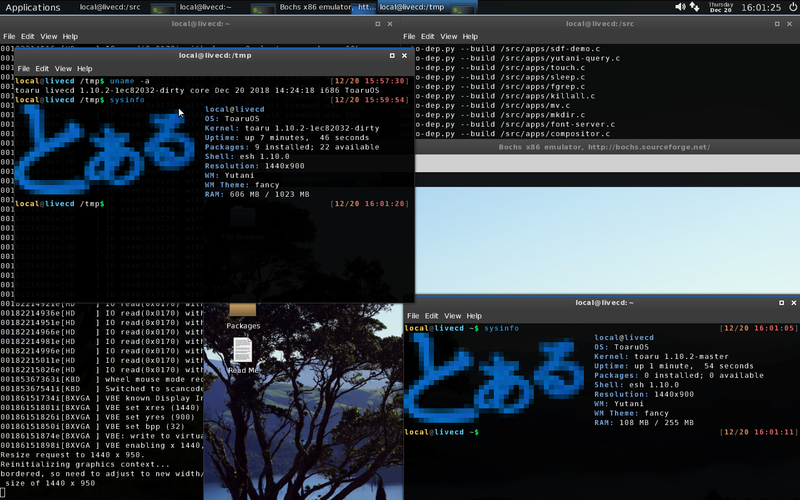 But first BusyBox, YASM and GCC (binutils are already done).